The Whole Story in a Nutshell! Harrison's Ideas! Cleveland's Ideas! A political broadside from the 1888 presidential campaign, not attributed to either side but obviously the work of the Harrison campaign. The central issue in the election was trade policy. The Democratic candidate, Grover Cleveland, attacked high tariffs as a burden on consumers|the Republican, Benjamin Harrison, supported them as a benefit to labor and industry. 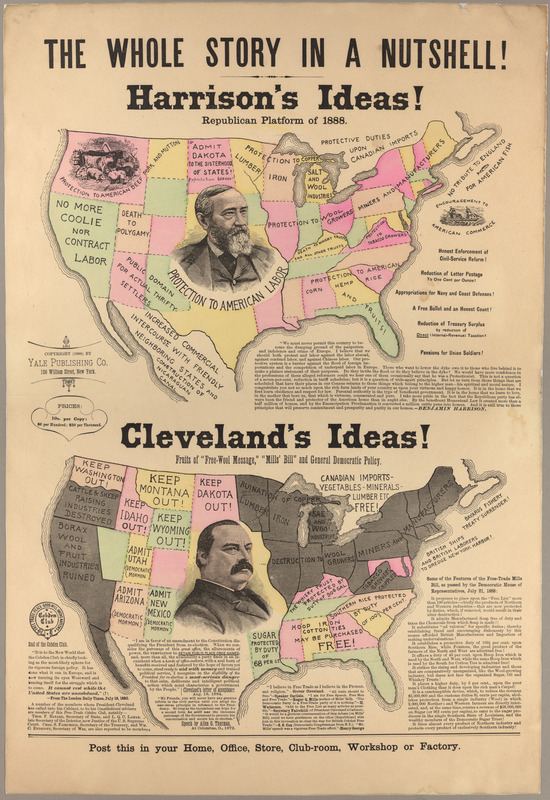 Cleveland narrowly won the popular vote, but because he failed to carry his home state of New York (see Notes for ID # 1089), he lost the electoral vote to Harrison. The broadside communicates Harrison's message in a variety of ways, subtle and not. The text describing him is upbeat: "Protection to American Labor - Encouragement to American Commerce - Reduction of Letter Postage - Pensions for Union Soldiers!" For Cleveland, just the opposite: "British Ships and British Laborers to Dredge New York Harbor! - Destruction to Wool Growers, Miners and Manufacturers - Tobacco Growers Crippled." Harrison's portrait is light and benign|Cleveland's is dark and scowling. All of the states in the Harrison map of the U. S. are in pastel tones|half of those in the Cleveland map are in ominous dark grey.